Preserve your jaw structure and prevent bone loss due to missing teeth and traditional dentures, with a superior alternative – All On 4 Dental Implants and Teeth in One Day. Book a Free Consultation Now. Say goodbye to traditional dentures, and say hello to an innovative system designed to give you an entire arch of brand new, natural looking teeth in one sitting. Having a full mouth of healthy and stable teeth means you can properly chew and digest all your favourite foods again. The secured teeth will also allow you to speak without the complications of denture slipping, giving you a higher sense of confidence, thus improving your overall quality of life. Unlike dentures, All-On-Four dental implants are tightly secured to your jawbone, freeing you from unnecessary adhesives and embarrassing moments. To make them last a lifetime, all you have to do is take care of them like natural teeth, brushing and flossing them regularly. 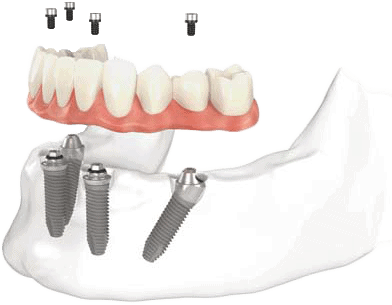 The 4 titanium implants used in this procedure are placed directly into your jawbone. By doing so, the implants preserve the structural integrity of your jawbone by minimizing gaps produced from fallen out teeth. This in turn will keep your face looking young for years to come. The All-On-Four dental implant procedure, also known as teeth-in-a-day, is an innovative system designed to give you an entire arch of brand new, natural looking teeth in one sitting. Instead of the more costly and time-consuming efforts of placing one titanium implant for each missing tooth, the All-On-Four procedure only uses 4 implants, which are secured to the lower or upper jawbone. These implants are then used to permanently attach an entire prosthetic arch of new replacement teeth, making your smile look whole once again. All On Four Dental Implants are not for everyone. If, for example, you only require a few implants due to missing or deteriorated teeth, it would be better to get individual dental implants. Can I go on eating what I want after the surgery? Most people can go on eating what they want right after surgery. In some cases, however, you may need to watch what you eat for the first few days until your new teeth settle in. Our dentist will guide you in the right direction with regards to this. Is sedation necessary for this procedure? Our anaesthesiologist will administer a conscious sedation process which will help block pain during the procedure making it as relaxing as possible for you. Conscious sedation also allows you to recover quicker than full sedation. What do I have to do to properly care for my new teeth after surgery? Treat your new teeth just like you should treat natural teeth. Brush them 2-3 times per day for 2 minutes each time. Instead of flossing, use a waterpik after each meal to clean the small spaces under your bridges and between the teeth. On top of this regular maintenance, you should also have your new teeth professionally cleaned twice a year. Do I need to have my remaining teeth extracted prior to the surgery? Tooth extractions will typically occur on the same day as the implant placements to preserve bone density in your jaw. If too much time is given between tooth extraction and implant placement, your jawbone structure can change, complicating the implant procedure. Most people only feel very little amount of pain or discomfort which usually subsides within 3 days. Do I get to choose what my new teeth will look like? During your consultation, you will have time to look through a smile gallery with pictures of previous patients who have selected the smiles in the gallery. You can also bring in pictures of your ideal smile and we will try to include as many aesthetic qualities as possible without compromising the functionality of the teeth. Is it more stable to get 6 implants instead of only 4? Every case is unique when it comes to how many implants should be used and this will be discussed at your consultation. Generally speaking, 6 implants may require bone grafting and/or a sinus lift, costing more money with often times higher failure rates than 4 implants. On top of this, more implants can result in greater natural bone area reduction. Doesn’t it take anywhere from 4-7 months for implants to osseointegrate with the jawbone in order to attach the replacement teeth? It’s true that implants typically take several months to fuse with your jawbone, however, in this procedure the four implants are connected with a titanium bar to add stability right away. This allows you to have a fully functioning set of new teeth right after the surgery is complete. How long does the denture implant procedure take? The denture implant surgical procedure only takes few hours to complete. Tooth extractions will be completed first, followed by inserting the titanium implants which takes approximately 1-2 hours per arch. Once complete, you will be given great looking temporary teeth which will later be replaced by permanent teeth. The surgical procedure only takes a few hours, however, you will need to come in beforehand so the appropriate CT scans and x-rays can be taken. You will also need to come by afterward to have your permanent teeth attached to the implants.